Mutualisms are defined as interactions between organisms of two different species, in which each organism benefits from the interaction in some way. These types of interaction are common and ubiquitous throughout all ecosystems, and scientists are increasingly recognizing the important role that they play in ecology. Mutualisms may involve either the exchange of resources, such as shelter, food and other nutrients, or they may involve the exchange of services, such as protection, transportation or healthcare. Sometimes mutualisms are symbiotic relationships. In such cases, the two species live in close proximity to each other for part or all of their lives; however, not all symbiotic relationships are mutualistic. If the mutualism is vital for the growth, survival or reproduction of an organism, it is obligate; this is the case in many symbioses. If the mutualism benefits an organism, but the organism is not so dependent on the mutualism that it cannot survive without it, this is called a facultative mutualism. Mutualisms may also be species specific or diffuse. In specific interactions, each species only has a mutualism exclusively with the other, whereas diffuse interactions involve multiple interactions between many different species. The concept of a mutualism is in contrast to interspecific competition, which occurs when organisms from different species compete for a resource, resulting in reduced fitness for one of the individuals or populations involved while the other benefits. A mutualism in which one mutualistic partner removes parasites, as well as dead or diseased skin from another, in return receiving a steady supply of food, is called a cleaning mutualism. One of the most notable cleaning mutualisms is the relationship between the genus of wrasse fish Labroides and their many ‘clients’. The wrasse is a small fish, with striking lines of bright coloration along its body. They reside within areas of tropical reefs, which are known as ‘cleaning stations’, advertising their services by performing a ‘dance’ (they make quick movements up and down, undulating their bodies in the water). Throughout their lives, many species of fish become infected by ectoparasites, which spawn in open water and attach themselves to the skin and other glands of fish in order to feed on the host’s blood; these parasites are mostly benign and probably just cause an irritation. However, they also pose a risk to fish through the transmission of disease. To rid themselves of the parasites, the fish visit the cleaning stations, and allow the wrasse to move up and down their bodies (even inside their mouths), searching for and eating the ectoparasites. Although the cleaner fish put themselves into apparent danger by swimming so close to larger predators, the benefits of the cleaning service to the client outweighs the benefits of eating the cleaner, and the cleaners are almost never harmed; most cleaner fish even have a clientele of repeat customers! 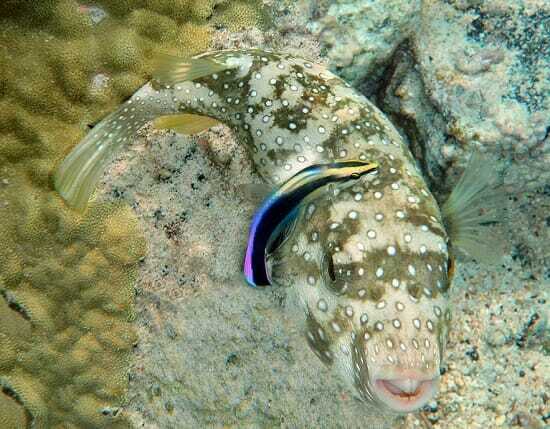 The image above shows a cleaner wrasse (Labroides Phthirophagus) searching for parasites on the body of a White-Spotted Puffer fish (Arothron hispidus). Terrestrial examples of cleaning mutualisms can be seen in several species. Capybara (Hydrochoerus hydrochaeris), large rodents native to Brazil, have ticks, horseflies and other parasites removed by a range of different birds, for example, the shiny cowbird (Molothrus Bonariensis), the yellow-headed caracara (Milvago chimachima) and the Wattled Jacana (Jacana jacana). The red-billed oxpecker bird (Buphagus erythrorhynchus) eats ticks from many species of large mammal such as cattle, deer and rhinoceros. As well as receiving the benefit of parasite removal, the red-billed oxpecker alerts its host to danger, by flying high in the sky and making loud noises. Cleaning mutualisms are generally diffuse relationships, as the interactions are not entirely species specific, with many different cleaners specializing in one client, or many clients using the services from one species of cleaner. Nearly all pollination services involve a mutualism that has evolved over millions of years. This kind of mutualism involves a resource for services interaction. Bees, birds, moths, butterflies and other pollinators visit flowers because they contain nectar, a sweet food source that is secreted by the flower. Once a pollinator arrives at the plant, it must make contact with the flower in order to obtain the nectar. During this contact, pollen grains stick on to the body and legs of the pollinator. The pollinator then flies away to feed from the next plant, taking the pollen with it. Subsequent visits to other plants ensure that the pollen from the first plant is distributed far away. Many species of pollinator have highly specialized relationships with their host plant. Plants have evolved specific morphologies to ensure that the pollen is only transferred to other members of its species; this is called a pollination syndrome. The pollinators, in turn, have to adapt to this pollination syndrome, a process which drives the changes in morphologies and species diversification even more. Often, this involves the evolution of very long, thin tubes, which hold the nectar, resulting in the evolution of pollinators with long tongues or beaks, so that the nectar store can be accessed. However, pollen syndromes can be seen in all flowers, as their bright coloration is an evolved trait, designed to attract certain pollinators. An example of a highly specialized, obligate mutualistic symbiosis is the interaction between the fig wasp and fig trees; the life cycles of both depend on the other. The queen fig wasp enters the fig (inside is a cluster of flowers and seeds) via an opening in the base of the fig called the ostiole, losing her wings and antennae in the process. Once inside the fig, the wasp lays her eggs and simultaneously deposits the pollen, which she carried from another fig; in doing so, she fertilizes the fig’s ovaries. Once she has laid her eggs, the queen dies and her body is digested, providing nourishment for the fig. Once the eggs hatch, the males and females mate with each other. The females begin to collect pollen, while the males start to dig through the flesh of the fig to the exterior, creating an exit route for the females. The females leave the fig, and travel to another tree, carrying with them the pollen, which begins the reproduction cycle for both fig and fig wasp all over again. Symbiosis – An interspecific relationship between two organisms, in which they live in close proximity with one another. Parasitism – A non-mutual interspecific relationship, where one organism benefits at the expense of the other. Commensalism – An interspecific interaction in which one species is benefitted, while the other is unharmed or unaffected. Competition – The interaction between species that are competing for the same resource, in which one or both of the species are harmed. B is correct. The relationship is diffuse. The red-bill oxpeckers have cleaning mutualisms with many species of mammal; they are not specialized to one species. 2. What is the resource involved in cleaning mutualisms? B is correct. Cleaning mutualisms provide the cleaner with a constant supply of food, while providing protection from predators and the removal of parasites to the client. 3. Which of the following statements is true? In an obligate mutualism, __________________________. C is correct. Obligate mutualisms are necessary for the survival of one or both of the mutualistic partners. This is seen in the case of the fig and fig wasp.